The SPECTRUM (LGBTQ+) Film Festival returns for the 2nd year at the Martha’s Vineyard Film Center in Vineyard Haven, Massachusetts, from Thursday April 26 through Sunday, April 29, 2018. 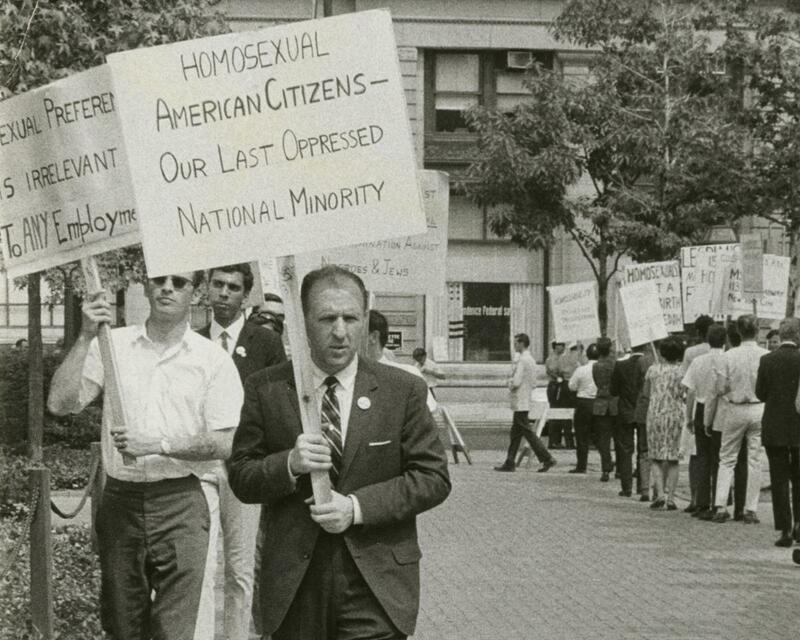 This year’s Opening Night Event features the new documentary THE LAVENDER SCARE which describes the federal witch hunt for gays and lesbians within all branches of the U.S. government during the McCarthy Era of the 1950s and 1960s. With little regard for its impact on people’s lives, the finger-pointing at gays and lesbians led to ruined careers, shattered families and even death by suicide. Producer/director Josh Howard is scheduled to appear and conduct a post-screening discussion about his film, followed in the Film Center lobby by a wine and dessert reception (sponsored by Tilton Rental). In a major coup, this year’s festival will conclude on Sunday, April 29 with the full-day event, ANGELS IN AMERICA, The National Theatre’s production of the Pulitzer Prize-winning drama recorded last summer in London. Running over seven hours in two parts, this production is the same currently running on Broadway, starring Andrew Garfield and Nathan Lane. Scheduled with a dinner break, patrons from the Cape will have the ability to watch the entire production and still make the last ferry to Woods Hole. New this year are All-Access Passes as well as SPECTRUM festival t-shirts (for which all proceeds benefit MVRHS’s Gay-Straight Alliance to help fund the students’ trip to the Boston Youth Pride Event held at Boston City Hall on May 19). Also, this year, any student age 13 to 21 will receive free admission to any SPECTRUM event. Live music will also be added to this year’s offering as part of the post-show reception following the Friday, April 27 screening of the feature BECKS. Local musicians Siren Mayhew and Sean McMahon will play original music while filmgoers participate in the beer and wine reception (sponsored by MVY Radio). In an effort to help establish a new memorial scholarship for the late Tony Lombardi (who championed the first SPECTRUM Film Festival in 2017), all ticket purchases (both at the door and online) will include an additional one-dollar surcharge per ticket. On Saturday, April 28 at 4:30pm, past and present members of the U.S. Military will receive free admission to TRANSMILITARY at the door (pending availability). Making its Massachusetts premiere, A MILLION HAPPY NOWS, winner of multiple film festival awards for “Best First Narrative Feature,” tells the story of a veteran soap opera star who retires early in her career to a beach house with her partner/publicist. Her soon-revealed Early Onset Alzheimer’s strains her ability to interact with the public as well as the couple’s relationship – until they find the strength to redefine what they mean to each other. In one of its first screenings since this year’s Sundance Film Festival, BELIEVER, a new film by Don Argott, follows Dan Reynolds, lead singer of the American rock band Imagine Dragons, who grew up in the Mormon Church. When he noticed the suicide rate spiking amongst teens in his home state of Utah, Reynolds decided to take on the mission to explore how the Church treated its LGBTQ members. In its Massachusetts premiere, THE LAVENDER SCARE, narrated by Glenn Close, details the fear of gays and lesbians in the government during the time of the Cold War, delving into the careers ruined, the families torn apart and the brave few who rose to create the first Gay Rights movement in America. In the first Hollywood studio film centered on a gay teen protagonist, LOVE, SIMON is based on a best-selling YA novel, in which a high school boy keeps a huge secret from his family, his friends, and all of his classmates: he’s gay. When that secret is threatened, Simon must face everyone and come to terms with his identity. After a breakup with her girlfriend, a Brooklyn musician (Tony Award-winner Lena Hall) moves back with her Midwestern mother (Oscar-winner Christine Lahti). As she navigates her hometown, playing for tips in a friend’s bar, an unexpected relationship begins to take shape. Currently, over active 15,000 service members in the U.S Armed Forces identify themselves as transgendered. In one of its first screenings since its premiere at last month’s SXSW Festival, the award-winning documentary TRANSMILITARY follows the story of four outstanding soldiers as they contend with a bureaucracy of ignorance and rules that defy their understanding of Self. Directed by Sebastián Lelio (director of the Oscar-winning A FANTASTIC WOMAN) and based on the best-selling novel, DISOBEDIENCE follows a rabbi’s non-practicing, lesbian daughter (Rachel Weisz) as she returns to the world of the Orthodox Jewish community in London, only to find her former lover (Rachel McAdams) married to her cousin. Winner of the Pulitzer Prize for Drama and considered to be one of the most important plays of the last hundred years, ANGELS IN AMERICA was captured live in performance on the London stage last summer. Starring Andrew Garfield and Nathan Lane, ANGELS IN AMERICA is a complex, symbolic look at homosexuality and AIDS in America in the 1980s. Part Two: Perestroika has a running time of four hours (including two intermissions) and begins at 5:15pm, ending at 9:15pm – in time to allow Cape patrons to take the 9:30pm ferry from Vineyard Haven to Woods Hole.